For many reasons, it’s always sad to hear about Nurses going on strike. You are the most dedicated and caring people we know, so for Nurses to call a strike, things have to be pretty bad. We’re saddened to share the news that the Nurses at Tufts Medical Center went on strike today. Like most people, we immediately think about the patients affected, but we also think about you, the Nurses and how you’re affected. We hope this gets resolved very soon. Here’s the story. Please let us know your thoughts. Nurses flooded the streets outside Tufts Medical Center Wednesday in the first strike of its kind at a major Boston hospital in 31 years as hospital executives vowed to lock them out for the next four days with no contract settlement in sight. Starting at 7 a.m. Wednesday, nurses rallied, chanted, and carried signs outside the main entrance. Some 320 replacement nurses were brought in to work through Monday, and executives promised to keep the Chinatown hospital running without any interruption in patient care. Hospital executives said about 60 surgeries planned for Wednesday were performed as scheduled, and patients were keeping their appointments. 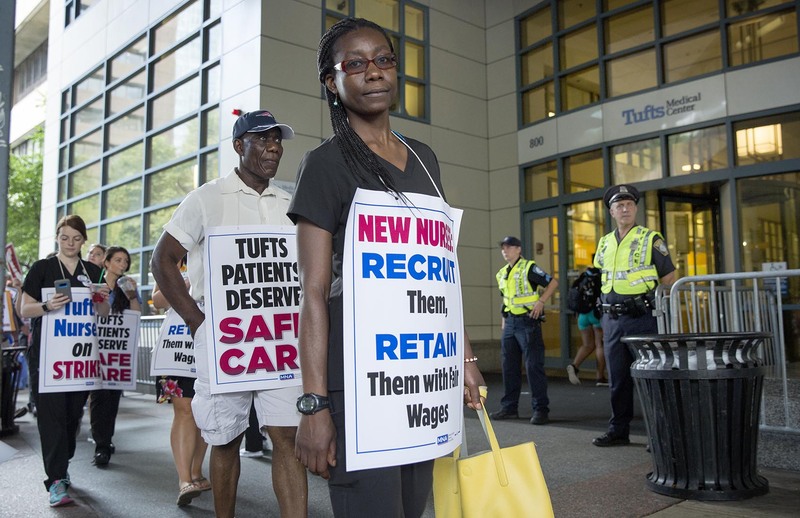 The strike came after about 15 months of talks failed to produce a new contract for the 1,200 registered nurses at Tufts, a 415-bed teaching hospital that treats children and adults. The Massachusetts Nurses Association, which represents the striking nurses, says it is seeking increases in pay and staffing levels, but both sides deadlocked over another key issue: retirement benefits. The hospital wants nurses who still have pensions to move into defined-contribution plans, similar to 401(k)s, which would save the hospital money. The union has fought to keep the nurses’ pensions. Mayor Martin J. Walsh, a former labor leader, urged Tufts’ administrators and nurses to return to the bargaining table. “A prolonged strike or lockout does not help Boston, does not help the patients, and does not help find a resolution,” he said in a statement. But unlike last year, when Walsh helped avert a nurses strike at Brigham and Women’s Hospital, the mayor said he has not been asked to help broker a deal at Tufts. The union has said for days that its members were prepared to strike. But Julia Agri, a Tufts nurse for 9½ years, said she never expected to walk out. When she finished working the overnight shift Wednesday morning, she was escorted out of the hospital along with other nurses. Then she grabbed a sign that read, “If Tufts Nurses Are Out Here Something is Wrong in There,” and joined her colleagues picketing on the sidewalk. Mary Havlicek Cornacchia, a nurse at the hospital for 29 years and cochairwoman of the union’s bargaining team, said it was “heartbreaking” to strike. Chief nursing officer Terry Hudson-Jinks, a member of the management team, said contract talks collapsed not over patient care issues but over money concerns. “No one wins in a strike,’’ she said. Currently, nurses at the top of the wage scale at Tufts make about $63 per hour. At the Brigham, the top wage is about $70 per hour. Nurses also have the opportunity to earn overtime and other additional pay. Both sides agree that nurses’ wages at Tufts are below those of other Boston hospitals. Tufts officials say they want to rectify that by offering a 10.5 percent raise over about four years to nurses at the top of the pay scale. All other nurses would receive a 5.5 percent pay hike over four years, in addition to 5 percent annual step raises, which are already built into the contract. The 320 replacement nurses, hired for about $6 million, were brought in by a national staffing agency from across the country and trained off-site in preparation for the strike. Hospital executives said the replacement nurses were hired on a five-day contract, so the striking nurses would not be allowed back into the hospital until Monday. But the striking nurses said they would try to return to work Thursday morning. State health inspectors said they will remain at the hospital throughout the strike and lockout to monitor quality of care. Six officials from the state Department of Public Health arrived at Tufts at 6 a.m. Wednesday and stayed until noon, hospital executives said. They plan to return twice a day at unannounced times until the striking nurses return to work. The state Department of Mental Health is also at the hospital. The health department required Tufts to submit a comprehensive strike plan that includes staffing details, but the agency refused to release the plan to the Globe Wednesday. The strike, in a traditionally labor-friendly city, drew a scores of supporters to the sidewalk outside the hospital, including union firefighters, laborers, carpenters, and a parade of state and city politicians. “This is about a bigger promise, the promise that if you come to work every day and you work hard and you make sacrifices, you will have a pension, you will be able to retire,” Senator John F. Keenan, a Quincy Democrat, said at an afternoon rally with the nurses. One nurse, Paula Sinn, said she had one patient set to receive an infusion for a neuromuscular disease who postponed treatment because she didn’t want to cross the picket line. Jacqueline Buzzard, an Exeter, N.H., resident waiting for a heart transplant, kept her appointment at the hospital Wednesday, despite the strike. The nurses, she said, supported her when her heart ailment was diagnosed. While Bob Kilroy’s daughter was inside the hospital being treated for a major heart issue, Kilroy wrote “patient’s father” at the top of a union sign that read, “I stand with the Tufts nurses.” Then he walked the picket line with the nurses, saying they have provided compassionate, quality care for his daughter for years.